LTHForum.com - HanAhReum (aka HMart) coming to Niles! HanAhReum (aka HMart) coming to Niles! LTH Home > Chat > Shopping & Cooking > HanAhReum (aka HMart) coming to Niles! Very interesting; I've never tried to return any "fresh" food at an Asian market before - it's never seemed like a possibility in all my family's year's of patronizing Asian markets. It was usually an "Oh well, guess we won't buy their tofu anymore" kind of thing. Nice to know their customer service and return policies are that good. We also visited HMart this Saturday. Had a quick late lunch at the food court, and I agree with the Korean poster in one of the HMart threads that the offerings at the food court are not that remarkable. We sampled the mandoo, Korean and sushi stalls (as the Chinese-Korean stall didn't seem to want our business - will elaborate later). The food is pricey for what you get in quality and quantity. $6 for 6 mandoo (that's pretty outrageous even for handmade skins) and $1.50 for the tiny "jumbo bun" is just plain crazy (the fillings weren't that great either). The Korean stall's bulgogi plate was decent, but certainly nothing we'd order again since we can make better at home and at $9.99 not a deal; Even dining in a Korean restaurant would be similar in price, you'd get more pan-chan, and get to grill your own (vs cooked in a wok at the stall). Having been spoiled at the "local" Japanese markets, the sushi offerings were prosaic in comparison and the prices equal to mid-range sushi restaurants. No deals or variety to be found here. Re: the Chinese-Korean stall, we tried to order the jampong, but was informed by the countergirl that the noodle-making machine was broken which was then followed up by a quick, and we don't offer noodles after 4pm; The only food avail would be the steam table entrees (which had just been picked over by the Hispanic kitchen staff having their own lunch). Well a few things - First off it was 3:15, they had 3 bowls of freshly made jajamyun sitting on the counter awaiting pickup (so the machine JUST broke? after those three orders? ), AND now I was offered the leftovers after the work crew had just eaten? That's OK - we just moved on. One thing that did stand out was the bakery. The offerings look absolutely fantastic and resembled the great Asian bakeries you'd find in upscale dept stores or malls in Japan or Hong Kong (can't comment re: those in Korea, but I imagine the same). We didn't pick any up as my wife has been on a Japanese pastry & bread baking kick for the past few months. Re: the grocery store itself, the produce is fresh and the variety immense. The prices for most things is very reasonable if not the cheapest "in town." On this Sat visit we got black plums for .49/lb, driscol strawberries .99/lb container, scallions 5/$1, baby bok choy (not the bok choy miu which were 1.39/lb) for .39/lb, red leaf lettuce 2/$1, campari tomatos .50/lb carton and gai lan for .69/lb (albeit more mature plants). Current sales include BOGO for pulmuone tofu 1.49, BOGO for S&B curry $3.99, 21-25ct bangladeshi tiger shrimp $10/2lb bag amongst other sale items. The seafood dept is well kept and has great variety. We picked up some of those lively Maryland blue crabs (most lively I've ever had, as I was pinched at least 3 times cleaning 'em last night - they usually don't have enough strength to do that) $2.99/lb males. I was surprised to see fresh (if not live) small sea cucumbers in little plastic baggies (like you'd take your pet goldfish home in); They also have giant sea cucumbers for sale. The pan-chan bar in a way, is not as good (for non-Koreans) as the old Chicago Food pan-chan bar, b/c HMart only stocks "more exotic" things that Korean families usually don't make at home like spiced fish roes, mini-crabs, spiced mollusks - they don't carry many typical vegetable pan-chan/kim-chi's you'd get at restaurants or that Korean families would make at home. Re: the comment about frozen Korean meat by GGnome, since most Korean families often eat their meats marinated and thinly sliced for the grill, you'll find that a majority of the beef and pork products will indeed have been frozen to facilitate the slicing process. I was surprised to see them offering choice grade ribeye, thinly sliced for sukiyaki and shabu-shabu (albeit a little pricey). They also had whole tenderloins for only $5.99/lb (which if choice grade, would beat even Costco's price for whole tenderloins). I have a question regarding the meat being sliced so thin for the grill. I'm assuming you mean griddle, not grill, right? I bought some beef bulgogi at Hyundai Supermarket in Northbrook and while it was tasty, the pieces were so finely sliced they tended to fall through the grates. I'm going to broil them from now on. Octarine wrote: I have a question regarding the meat being sliced so thin for the grill. I'm assuming you mean griddle, not grill, right? No, I usually manage it on the gas grill, and the legendary LTH Banquet last year certainly cooked the same style meats on live coals. It takes a careful hand -- lay the slices across the grates, not along them, and a very clean grill, or they'll stick (due to the sugars in the marinade), and all you'll get back is shreds. Well, you may just get shreds anyway. There is some waste typically, but the thin-sliced ribeye at Korean markets is so darn inexpensive usually that I buy more than I would of, say, arrachera for fajitas. Octarine wrote: I have a question regarding the meat being sliced so thin for the grill. I'm assuming you mean griddle, not grill, right? I bought some beef bulgogi at Hyundai Supermarket in Northbrook and while it was tasty, the pieces were so finely sliced they tended to fall through the grates. I'm going to broil them from now on. These are often used in a "disposable fashion" for home grillling or beach/river-side grilling. You pick 'em up in the ubiquitous dollar stores in Asia. Or in the restaurant these "grill plates"
The spacing btwn grill lines (is that a term?) is not as wide as in standard American grills hence less "falling between the grates." The grill style in the very bottom has no "holes" at all (which I don't like), but this style is often served with a broth in the outer "moat" which is filled with thin vermicelli noodles which cooks in the broth and is flavored by the meat drippings/marinade as the meat cooks up top. My boyfriend and I decided to take a field trip through the rain to Super H Mart on Sunday before the Bears game. My parents have been building up this experience as being like the Costco and Disneyland of Korean markets. Needless to say, I was slightly skeptical. Sunday was super busy, with not much room in which to maneuver the shopping carts. My guess it was the post-church Sunday Korean crowd, but after my mom told me 20K people visited the Super H on its opening day, the crowds seem like they'll be there for a while longer. Upon first walking in, there is a very large food court, but I was first drawn to the aisles and aisles of produce. I was very impressed--$2 for a huge bunch of basil! $.99 for Driscoll raspberries! Fresh Lychees! But I was there on a mission--to cook my first Korean meal ever for another human being, and that guinea pig being my boyfriend. It took me about a half an hour to find red pepper powder (ggo choo gga ru)--after which I did my newly named red pepper powder dance. It took me another fifteen minutes to decide which kind of frozen dumplings to buy. A very nice Korean girl, not much younger than myself, told me to buy the Pulmuone brand. When asked why, she told me "these are prettier." I said thank you and grabbed another bag that I had tried before. Since my boyfriend is a vegetarian, I didn't really explore the fish market, but there were piles of squid being cleaned by an employee and a self-service bin of live blue crab that provided me with a good 5 minutes of entertainment, watching Korean grandmothers negotiate tongs and claws and plastic bags. There are many other asian foods represented there (we bought a can of chinese kung pao gluten) plus all your grocery staples (I bought sugar free orange and raspberry jello cups). I did miss the packaged ready-to-eat food that you find at many smaller Korean Markets (chicken wings or fried mandoo at Chicago Food Corp), and will probably visit the food court at the H another time. I also couldn't find fresh chewy rice cakes (dduk), but the frozen ones I bought worked out just fine for dinner. I ended up not doing so much grocery shopping as I wanted. Instead I bought the cooked foods from the area behind the kimchee counters. Chicken Wings were labeled sweet and sour, and looked like the Sweet and Spicy ones, especially with a chilli pepper right on top. But they were not in the least bit spicy. They were crunchy and sweet even when cold. Pumpkin Porridge had a thich consistency that I did not care for. So I thinned it down with some chicken stock. It was sweet and creamy, perfect for that rainy afternoon. There was also an assorted pack of panchan (bean sprouts, shiitake mushrooms, zucchini and some white things in strips). They were ok... I prefer Chicago Food's Panchan bar. Sharona wrote: $.99 for Driscoll raspberries! I saw those last night, but by that time I had already grabbed two of the two-for-a-buck variety at the front door (Redi-Cut, I think). I should have picked up half a dozen -- I had some of these berries for breakfast and they were very good. Was knocked out by fish selection. Why are Monkfish heads sold separately from the bodies? Saw some five pound bags of Wasabi -- have to believe this place is like Costco and that they sell to a lot of restaurants and other food retailers. CrazyC: I guess you must have gotten there earlier in the day - by the time we were there none of the good stuff you'd mentioned was there - chicken wings, chapchae, etc... We did pickup a soup carton of yukejang. Glad to hear they've got the standard deli items as well. Looks like you found more vegetable pan-chan too. I only saw the stirfired "squish" as previously mentioned. Guess I'll be doing my shopping next time at 8:00AM right at store opening. Re: restaurant supply - there's a whole area to the right of the checkout lanes (after you checkout) that's actually labeled "wholesale." I saw a someone's shopping cart with two crates of nappa (that's a lot of kimchi to be made). The squid was on demo and special, as was "sashimi grade" fluke (per their sign) which they filleted (whole fish) on request. The squid was very tempting at $1.99/lb and of a decent enough size to grill whole "a la Japanese seaside seafood shack." Jay K wrote: I only saw the stirfired "squish" as previously mentioned. Guess I'll be doing my shopping next time at 8:00AM right at store opening. Early might not work either. I've gone early(ish) and found the cooked food area, behind the panchan counter, mostly empty. Not sure what's the best time, though communally we should be able to figure it out in short order. I was there around 3 pm or so. There were at least 5 containers of everything I bought. Maybe I got there right when they were put out? But there was anyone working that area when I was there.... Hmmm.. I just spent the afternoon at H-Mart -- and no kidding about its being crowded on Sunday. However, on the plus side, there were free samples and cooking demos all over the place. Passage through the store was complicated by the fact that they were restocking as people shopped, and there were dollies and crates and boxes and stock boys everywhere -- though that's proabably unavoidable when you have mobs like the ones surging through the store today. Agree that food in the food court was unremarkable -- at least my food from the Korean stall was, though my friend, who bought dumpling soup at the dumpling stall was very pleased with her choice. I was surprised by the bakery, and I could see making a meal out of the offerings there next time I go. We bought a number of things, including a "vegetable donut" (pastry stuffed with onions and smoked meat) and garlic bread that would, with a cup of tea, have made a nice lunch -- and for a lot less money than the food court offerings. In addition to the wonder of the main grocery store, I loved all the little shops around the outer perimeter -- and the wonderfully enthusiastic people staffing them. The passionate, sweet, sincere sales pitches were hard to ignore, though I actually only caved in for the ume plum and dried cactus honey tea at the Wellbeing Store. Best sales pitch was from the woman handing out samples of a 38-ingredient healthfood breakfast drink that is made right in the store. But the ingredients were costly and they sold the drink by 2-month bags at $69, so I thought I'd think about it. There was also a shop with wonderful, handmade tea pots and bowls. So while it was chaos, we still had a great time, and I'll definitely go back. Thanks for making it known. The Tribune writes about Super H-Mart. I made it there on a Sunday night at 8 pm and we had the place pretty much to ourselves. 1)Never seen so much fish is any other store. Not even 99 Ranch. I am going to have to try some varieties as I have time. 2) The shrimp and crabs were very large and very fresh. Hope that they continue to charge $3.99 for blue crabs. 3) The meat, while limited, is inexpensive and better than I expected. Boneless and skinless chicken breasts and thighs. That will be helpful to me. 4) The traditional Korean dumplings were pretty good although they had been there a while. Unfortuately, we did not have the time to try a few more items as we had a LONG drive home. 5) I liked the produce, What was there was very fresh and well stocked. I would have purchased perhaps 3x what I did but I just did not have the time to really look. What a place. I *might* break my rule of not driving long distances to shop. My comments are in BOLD - they are not jlawrence01's original text. 2) The shrimp and crabs were very large and very fresh. Hope that they continue to charge $2.99 for blue crabs. The blue crabs have been $2.99/lb since grand opening end of August - did they raise the price!?!? We've also been buying their snow crab for $3.99/lb. They sell whole albacore for $1.99/lb (was $2.50/lb) - although I'm not sure what to do w/ a whole albacore... or albacore in general, having only eaten it as sashimi or canned. We bought boneless skinless chicken breast last week for $1.49/lb (none of that weight-adding broth as you'd find in many American markets) and it's $1.69/lb this week. You won't find a better deal in town... at least I haven't. We've limited ourselves to just two hand-carry baskets, otherwise we'd load up so much (as in our 1st two visits) that we wouldn't have room in our fridge. Holey moley! Lovely Dining Companion had to drag me, kicking and screaming, out of this place after several hours. Stuff I've never seen, never seen fresh, never seen in Chicago....oodles and oodles of goodies. I could spend a day or two here easily. (Though I'll admit that Saturday afternoon is probably not the best time to go.) Acorn pudding, monkfish heads (as well as fresh monkfish), peeled Jacob's beans (? ), fresh fava beans (in late October! ), amazing discovery after amazing discovery. I won't belabor this post except to say if you have any interest in fresh produce or fresh fish, you owe it to yourself to visit. It's not without its flaws (I wouldn't consider it a regular grocery store) but it's clean, well-stocked (at the price of clogging the aisles), and with 13 checkout lines, even things this afternoon went quickly. We will be back...over and over again, even if I have to take a cab. We had our Maiden Voyage to H-Mart yesterday. One of the things we bought was a package of Driscoll's strawberries, and btw I was delighted to read this thread earlier and see that many of the other LTHers like Driscolls as well. My parents' kitchen counter always overflows with various fruits, and they were the ones who told me about the virtues of Driscoll's (and they're right!). One thing that amused me was the trip to the fish sauce aisle. I had Squid brand fish sauce on my shopping list, but couldn't believe it when I didn't see it in the aisle. Finally I did see it, but only in the form of a label beneath an empty shelf. So I guess hundreds of other Chicago shoppers also shop for that brand, huh? Oh well, there's a Thai store here in Lincoln Square that I know carries it - I hope they're open today. A few weeks ago after our evening at Burts, I bought a skate wing for $2.99 a pound. When I prepared it earlier this week, I had to filet it by running a boning knife which was pretty easy. This was a firm fleshed, sweet tasting fish as promised. I bought tilapia yesterday at Costco for $3.99 a pound, whose taste pales in comparison to the skate wing. I wasn't inclined to buy it really, except someone at home wanted the tilapia. There are so many varieties of fish there at H-Mart, I think we will shift our fish purchasig to H-Mart for price and variety. I took another trip out there at lunch time to prep for a thai yellow curry paste and spotted fresh whole Durian. I'm reluctant to bring home 10+ pounds of strange fruit, so someone else will have to tell me what it's like. 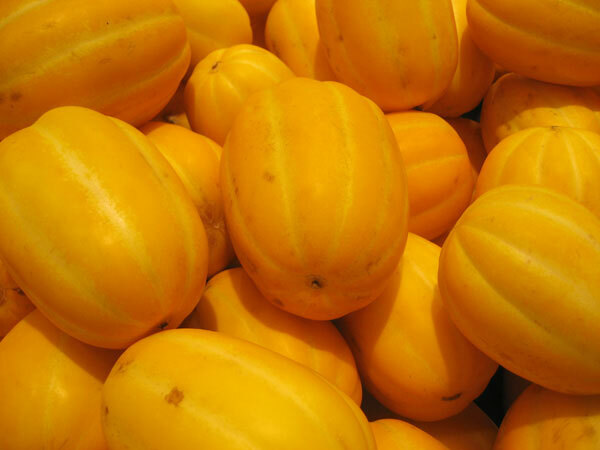 I detected very little smell from them, mainly earthy, somewhere between a melon and a squash. Nothing cheesy, rotting or manure-y about it. Maybe they're unripe? Maybe one of the food booths there will serve you durian bubble tea...that way you can get a whiff and decide whether you want to buy a whole one. And you're right across the street from Village Creamery where you can taste some durian ice cream. You know, I bought one on a whim a few trips ago and now I have a large frozen fruit in the freezer that I'm scared to defrost and try. Maybe this weekend, I'll give it a shot and report to the group. Ok, I took the durian out of the freezer to thaw on Friday. It looked thawed by Saturday night so I decided to crack 'er open on Sunday evening (today). The thawed but intact durian smelled pleasantly fragrant, like pineapple, cucumber and melon. Pressing carefully on the sides of the hull (the fruit is very spikey) I found the walls more pliable than I had expected. Gently shaking the fruit, I could feel telltale gelatinous vibrations from within. Using my trusty Shun Kershaw Chef's knife, I easily cleaved the durian in two. The odor was not nearly as intense as I had feared. I would describe it as oniony garbage, bad, but not as room-filling as reseach would suggest. I had happened to cut through 2 of the large seeds, each about the size of a matchbox. Surrounding the seeds was the edible portion: yellow and lumpy, kind of like scrambled eggs and chicken fat. Suppressing the smell, I have a taste. It's faintly sweet and fruity with a fatty, custardy texture. The smell, once in my mouth, overcame any pleasantness of flavor. I had a few bites but I wasn't able to get past the rotten onion/garlic sensation. I consider myself a pretty adventurous eater but durian got the best of me. At least I can cross it off my list and never have to try it again. Hmm..I wrote the above post tonight but it must have logged as an edit. Jay K wrote: . The squid was very tempting at $1.99/lb and of a decent enough size to grill whole "a la Japanese seaside seafood shack." Bought a couple three of these today; I'll report back later. However, I know this has been said already, but WOW! Thanks so much for the heads-up! I haven't seen a place like this since the DeKalb market near Atlanta. BrendanR wrote: I consider myself a pretty adventurous eater but durian got the best of me. At least I can cross it off my list and never have to try it again. just thank god you did not have to perform this rite of passage on a random curb of some random street in some random city of Jakarta in front of business cohorts while squatting. FWIW, fresh hot durian stink more. but we're getting sidetracked. i'm heading to H-mart this wknd. FINALLY. bump. H Mart = chilled soju. Last edited by TonyC on January 4th, 2007, 10:02 am, edited 1 time in total. Lord if I never see the words TonyC and Soju in the same sentance again it will be fine by me! 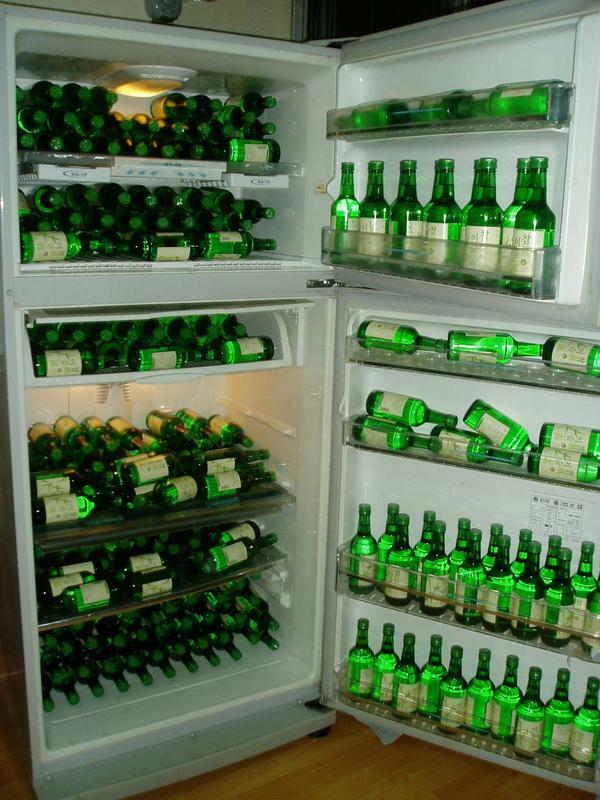 Remember kiddies the body IS and amusement park not a temple....drink Soju! Hit H-Mart again on Sunday and I think they've really got their act together. Not that it wasn't pretty damn good the other times I've been, but Sunday the store seemed more in tune, from the eat-in food at the kiosks to the sparkling freshness of the greens, clear-eyed fish, not frenetically busy aisles and quicker check out lines. In amongst the incredible array of produce was this oddly shaped item, I had seen it once before in Chinatown, but for the life of me I simply could not remember one damn thing I had been told. Luckily H-Mart had it well marked and it was a moment or two on the internet* for info on the weirdly aggressive appearing Caltrop. Turns out caltrop is an aquatic plant often referred to as a water chestnut. ^ yummy. steam it, crack it open in half, eat it like walnuts. 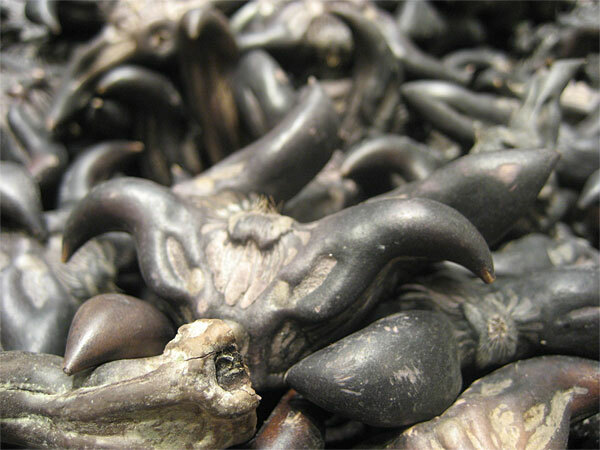 A bin full of caltrops, like the grisly trophies of a battle in Tolkien. 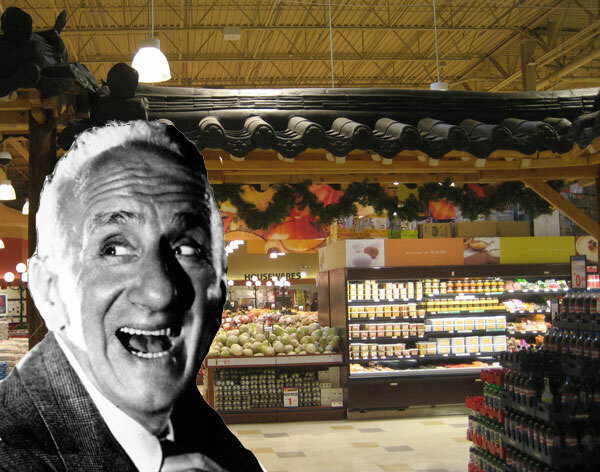 Jimmy Durante, singing "When You're Smilin'." Holy seaweed on a stick, this place is from the moon. You gotta see it for yourself. How are they? Anyone know?